Sometimes it isn’t very obvious how to enter data into a Code::Blocks window. 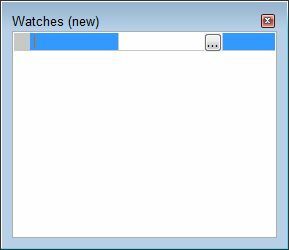 One of the windows that seems to be causing problems for a number of readers is the Watches window. 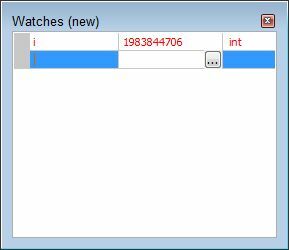 You open this window by choosing Debug | Debugging Windows | Watches. The purpose of this window is to let you view the content of variables in your application, which is an essential part of the debugging process. In order to view the variable (or other expression) content, you must enter it in the Watches window. Book III of C++ All-In-One Desk Reference For Dummies tells you all about debugging. One technique for entering the variable is to select it in the editing window and the drag it to the Watches window. The variable will appear in the Watches window along with its value. However, this approach only works for variables and expressions that actually appear in your code. You might want to enter some other expression (or manually enter the variable, rather than drag and drop it). The Watches window consists of rows and columns as shown here. Notice that the row is now white because it isn’t selected. However, you can see the name of the variable, i, it’s value 1983844706, and it’s type int. The row is in red because the value of i has just changed (unchanged values appear in black so you can see them easier). As you debug your application, you can now watch the value of i for changes. Sometimes it isn’t obvious how to enter information into Code::Blocks (or any other application for that matter). When that happens, the focus turns to the application, rather than the work you need to do, and the experience becomes frustrating. Let me know about your book-related Code::Blocks questions at John@JohnMuellerBooks.com and I’ll do my best to answer them. Because I don’t have a direct connection to the vendor, my ability to answer other sorts of questions is limited.